The JOURNAL OF ISLAMIC ARCHITECTURE (JIA) is an open access journal that publishes peer-reviewed articles on Islamic architecture. The articles that can be published in this journal is about architecture from the Islamic value perspective. It can discuss the architecture design, mosque architecture, landscape architecture, urban design and planning, historical and theoretical aspect of architecture, building science, and environmental architecture that are suitable with the Islamic value. Furthermore, papers that explore other disciplinary around architecture, such as art, history, archaeology, anthropology, and culture are also welcome. 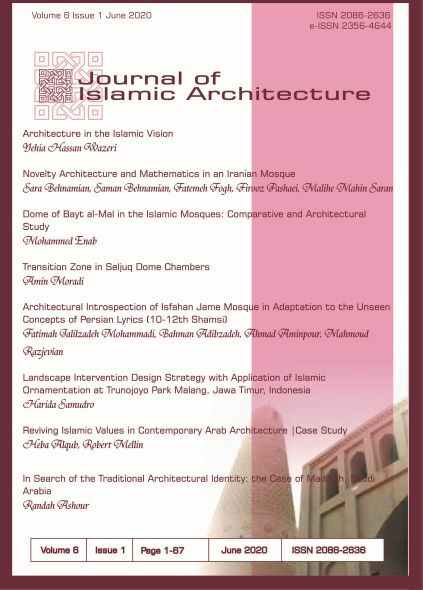 This journal not only talks about Islamic architecture in past years (history/vernacular/traditional architecture) but also in recent years (contemporary architecture). It can also speak about architecture in historic Islamic World (middle east and parts of Africa and Asia), as well as the more recent geographies of Islam in its global dimensions. JIA is published by the Architecture Department, Faculty of Science and Technology, Universitas Islam Negeri (UIN) Maulana Malik Ibrahim Malang, Indonesia. JIA is published twice a year in June and December since June 2010. JIA has been accredited by National Journal Accreditation (ARJUNA) Managed by Ministry of Research, Technology, and Higher Education, Republic Indonesia with Second Grade (SINTA 2) since the year 2016 to 2020 according to the decree No. 36b/E/KPT/2016. This journal has been distributed by EBSCO PUBLISHING started from Volume 4 Number 3 the Year 2017 to present. Please Click Archives to read the Journal content. 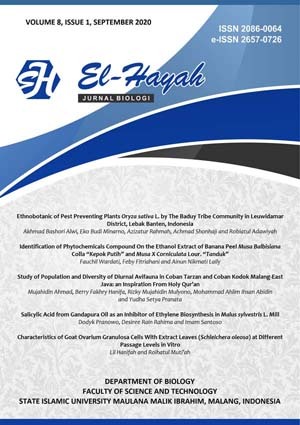 EL HARAKAH (ISSN 1858-4357 and E-ISSN 2356-1734) is peer-reviewed journal published biannually by Maulana Malik Ibrahim State Islamic University (UIN) of Malang. The journal is accredited based on the decree No. 36a E. KPT 2016 on 23 May 2016 by the Directorate General of Higher Education of Indonesia, for the period August 2016 to August 2021 (SINTA 2). The journal emphasizes on aspects related to Islamic Culture in Indonesia and Southeast Asia. We welcome contributions from scholars in the field, papers maybe written in Bahasa Indonesia, English, or Arabic. EL HARAKAH (ISSN 1858-4357 and E-ISSN 2356-1734) adalah jurnal peer-reviewed yang terbit dua kali dalam setahun dipublikasikan oleh UIN Maulana Malik Ibrahim Malang. Jurnal EL HARAKAH terakreditasi berdasarkan Keputusan Dirjen DIKTI No. 36a E. KPT 2016, tertanggal 23 Mei 2016, masa berlaku Agustus 2016 s.d. Agustus 2021 (SINTA 2). EL HARAKAH merupakan wahana komunikasi keilmuan insan akademik dalam kajian Budaya Islam di Indonesia dan Asia Tenggara. Redaksi mengundang para akademisi dan pemerhati budaya islam untuk turut berpartisipasi baik dalam bahasa Indonesia, bahasa Inggris, maupun bahasa Arab. 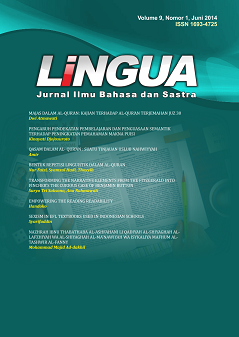 LiNGUA Jurnal Ilmu Bahasa dan Sastra (ISSN Print: 1693-4725 and E-ISSN: 2442-3823) is a journal of Linguistics and Literature which is published twice a year in June and December by Laboratory of Information and Publication, Faculty of Humanities, Universitas Islam Negeri Maulana Malik Ibrahim Malang. The journal covers language issues researched in the branches of applied linguistics, such as sociolinguistics, discourse analysis, critical discourse analysis, pragmatics, stylistics, corpus linguistics, and others. In the area of literature, it covers literary history, literary theory, literary criticism, and others, which may include written texts, movies, and other media. Article template can be downloaded here. CAUCHY: Jurnal Matematika Murni dan Aplikasi has been accredited by the Ministry of Research, Technology, and Higher Education of the Republic Indonesia as an academic journal (SK: 21/E/KPT/2018) since May 9 2018. We welcome authors for original articles (research), review articles, interesting case reports, special articles illustrations that focus on the Pure and Applied Mathematics. 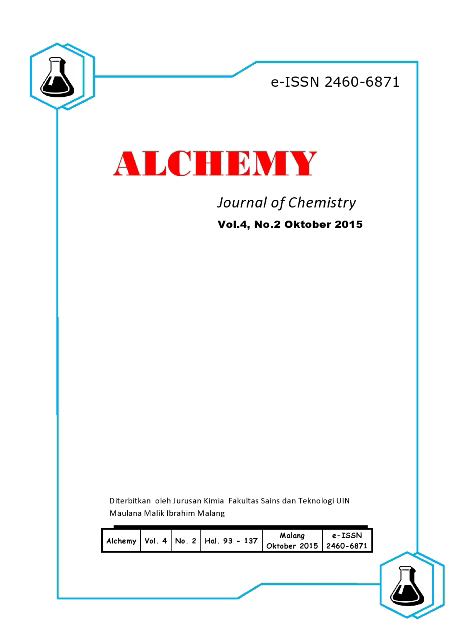 Our journal is indexed on DOAJ; Indonesian Scientific Journal Database (ISJD); WorldCat; OneSearch; Google Scholar. 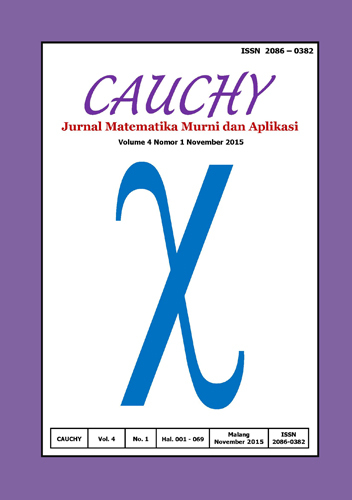 CAUCHY: Jurnal Matematika Murni dan Aplikasi has several changes and updates in its history as follows: 1). On 2009-2012, the cover color was changed from yellow to purple; 2). On 2013-2015, it used two-column system for the layout; 3). From 2016, it uses one-column layout and each article submitted to CAUCHY has to be written in English. Registration and article submission guidelines can be downloaded here. Jurnal Neutrino is physics journal and its applications (P-ISSN:1979-6374,E-ISSN:2460-5999) dedicated to publishing the good quality research across all aspects of experimental and theoretical applications of physics specialized in physics intrumentation, physics computation, biophysics, medical physics, environmental physics, nuclear physics, geophysics, electronics, optics and renewable energy. 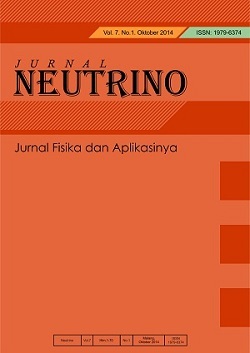 Jurnal Neutrino was first published in October 2008 in print version ISSN 1979-6374. The publication of Jurnal Neutrino aims to be the forum for academics and practitioners to write and publish their latest work. It is also to be a communications media amongs physicist in the world. As Jurnal Neutrino had limited reader, Starting from 2012, Jurnal Neutrino published online version under Open Journal System (OJS). In 2015, Jurnal Neutrino formally received e-ISSN 2460-5999. Jurnal Neutrino is now indexed by DOAJ, Crossref and many more. De Jure: Jurnal Hukum dan Syar'iah was formerly a potpourri of articles in the field of law and Islamic law. It published bi-annually, in June and December since 2009 (printed version). Starting 2016, De Jure: Hukum dan Syar'iah consistently publish 10 articles in a year. And from December 2016, it is focusing on publishing articles in the field of Family Law with various aspects that consist of articles of researches and academic thoughts. 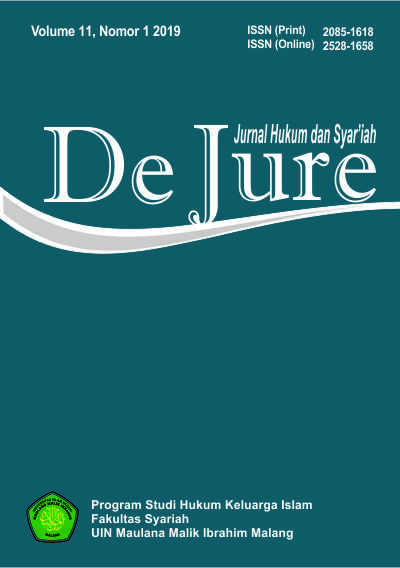 De Jure: Jurnal Hukum dan Syar'iah is a medium of academic publication and communication for experts and researchers, especially manuscript that discuss about marriage, inheritance, grant, testament, endowment, almsgiving, and alternative dispute resolution for family. It welcome manuscript submissions that has never been published elsewhere. 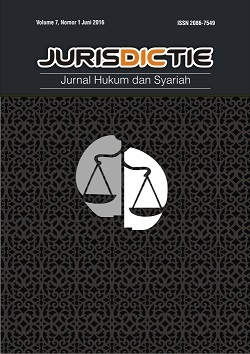 Jurisdictie (print ISSN 2086-7549, online ISSN 2528-3383) is peer-reviewed national journal published biannually by the Law of Bisnis Syariah Program, State Islamic University (UIN) of Maulana Malik Ibrahim Malang. Jurisdictie has been accredited (Sinta 3) by The Ministry of Research Tecnology and Higher Education of the Republic of Indonesia (SK Dirjen Penguatan Riset dan Pengembangan Kementerian Riset, Teknologi, dan Pendidikan Tinggi No. 10/E/KPT/2019). 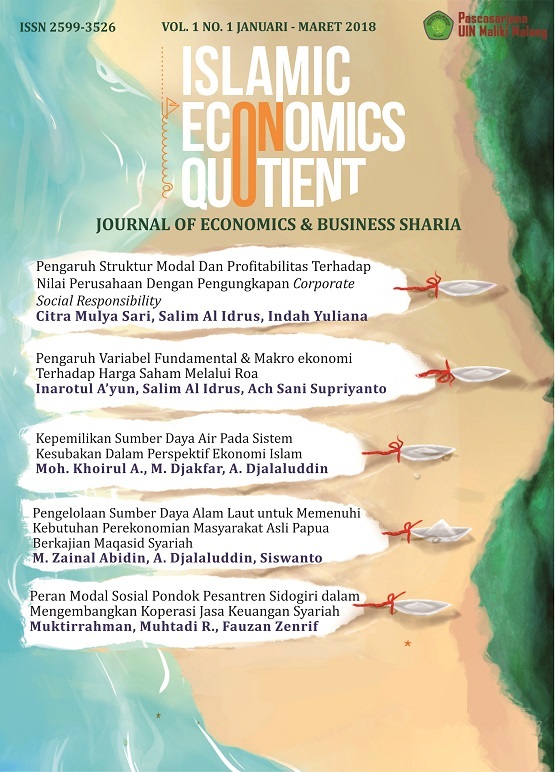 The journal puts emphasis on aspects related to economics and business law which are integrated to Islamic Law in an Indonesian context and globalisation context. The languages used in this journal are Indonesia, English and Arabic. Jurisdictie has been indexed by Crossref since 2015. Therefore, all articles have unique DOI number. J-PAI adalah jurnal jurusan Pendidikan Agama Islam Fakultas Ilmu Tarbiyah dan Keguruan Universitas Islam Negeri (UIN) Maulana Malik Ibrahim Malang, sebagai wahana komunikasi insan akademik dalam bidang pendidikan agama Islam. Redaksi mengundang para pakar dan akademisi untuk menyumbangkan naskah, baik berupa hasil penelitian, kajian mendalam, sesuai dengan disiplin ilmu pendidikan agama Islam. Management and Economics Journal (MEC-J) is a peer-reviewed and open access journal that focuses on management and economics fields. This journal publishes original articles, reviews, and also interesting case reports. Letters and commentaries of our published articles are welcome. Subjects suitable for publication include but are not limited to the fields of Marketing Management, Finance Management, Strategic Management, Operation Management, Human Resource Management, E-business, Knowledge Management, Management Accounting, Management Control System, Management Information System, International Business, Economics, Business Economics, Business Ethics and Sustainable, and Entrepreneurship, etc. The papers received by this journal will be reviewed by some experts from several universities in different countries. 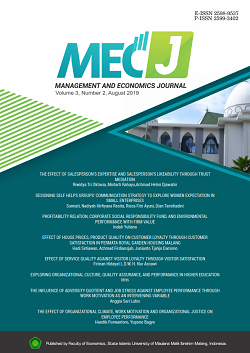 MEC-J is published three times a year in April, August, and December by Faculty of Economics, Universitas Islam Negeri Maulana Malik Ibrahim Malang, Indonesia. One volume of MEC-J is published in the one-year calendar. IQTISHODUNA Jurnal Ekonomi dan Bisnis Islam merupakan jurnal yang fokus terhadap kajian-kajian yang berkaitan dengan bidang Ekonomi dan Manajemen, yang meliputi beberapa sub bidang, yang diantaranya adalah Ekonomi Islam, Manajemen Bisnis, Manajemen Pemasaran, Manajemen Sumberdaya Manusia, Manajemen Keuangan, dan lain-lain. MATICS is a scientific publication for widespread research and criticism topics in Computer Science and Information Technology. 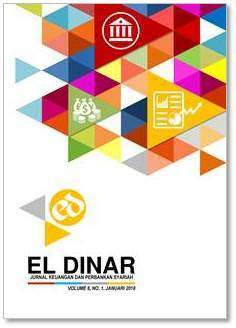 The journal is published twice a year, in March and September by Department of Informatics Engineering, Faculty of Science and Technology, Universitas Islam Negeri Maulana Malik Ibrahim Malang, Indonesia. The journal publishes two regular issues per year in the following areas : Algorithms and Complexity; Architecture and Organization; Computational Science; Discrete Structures; Graphics and Visualization; Human-Computer Interaction; Information Assurance and Security; Information Management; Intelligent Systems; Networking and Communication; Operating Systems; Platform-Based Development; Parallel and Distributed Computing; Programming Languages; Software Development Fundamentals; Software Engineering; Systems Fundamentals; Social Issues and Professional Practice. Paper template can be downloaded here. 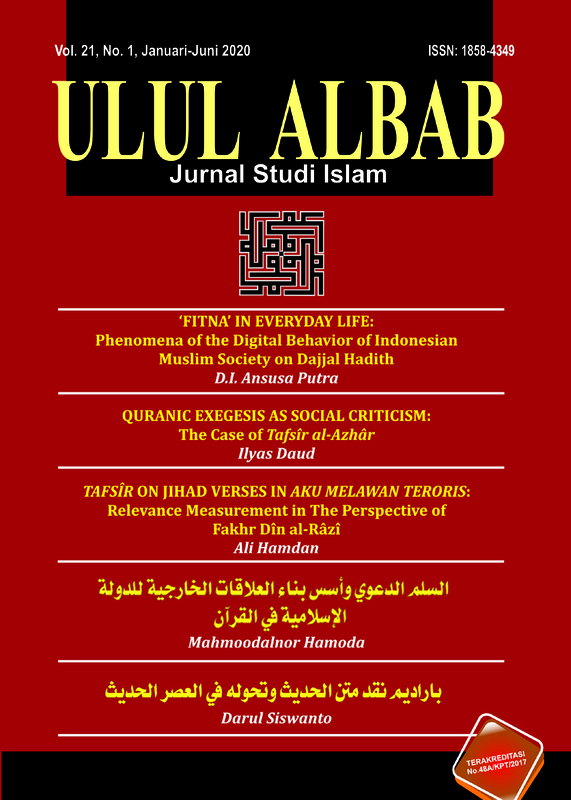 Adalah jurnal berkala peer-reviewed yang diterbitkan biannually atau setahun dua kali oleh Jurusan Perbankan Syariah, Universitas Islam Negeri Maulana Malik Ibrahim Malang. EL DINAR merupakan sarana komunikasi yang diperuntukkan bagi para peneliti, akademisi, maupun praktisi dalam bidang keuangan dan perbankan syariah. Demi mewujudkan kontribusi bagi pengembangan ilmu keuangan dan perbankan syariah, dewan redaksi mengundang para pemerhati untuk dapat berpartisipasi dalam menyumbangkan karya ilmiah berupa jurnal-jurnal penelitian. Klik Archives untuk melihat content dalam jurnal ini. Journal of Islamic Medicine is a medical journal published twice a year in March and September by the School of Medicine, Faculty of Medicine and Medical Sciences, Universitas Islam Negeri Maulana Malik Ibrahim Malang. 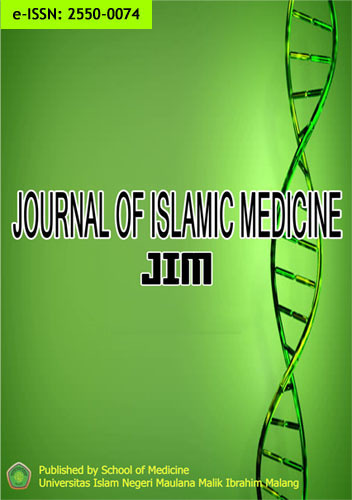 Journal of Islamic Medicine is a peer-reviewed and open access journal that focuses on promoting medical sciences generated from basic sciences, clinical, and community or public health research to integrate researches in all aspects of human health. 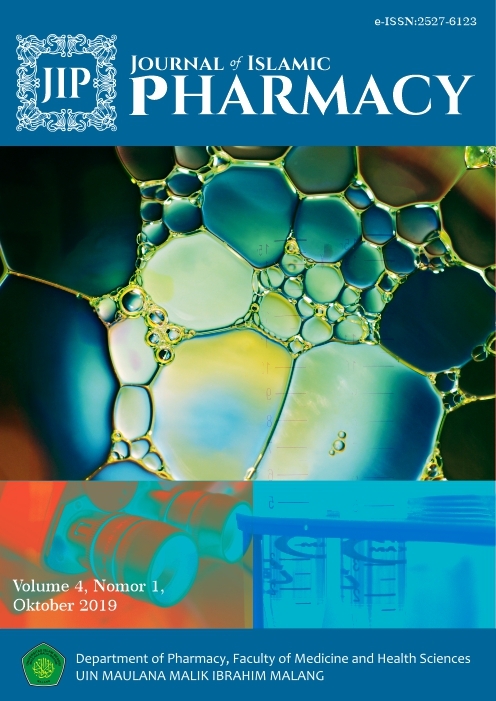 This journal publishes original articles, reviews, and also interesting case reports. Brief communications containing short features of medicine, latest developments in diagnostic procedures, treatment, or other health issues that is important for the development of health care system are also acceptable. Letters and commentaries of our published articles are welcome. El-Hikmah adalah Jurnal Fakultas Tarbiyah Universitas Islam Negeri Malang, terbit berkala satu semester sekali (bulan Januari dan Juli), sebagai wahana komunikasi keilmuan insan akademik dalam bidang kependidikan dan keagamaan. Redaksi mengundang para pakar dan akademisi menyumbangkan naskah, baik berupa hasil penelitian, opini mendalam, maupun book review yang sesuai dengan disiplin ilmu pendidikan dan keagamaan. Naskah yang dimuat adalah naskah asli dan belum pernah dipublikasikan di media massa lain. Silahkan klik Archives untuka melihat content jurnal ini. 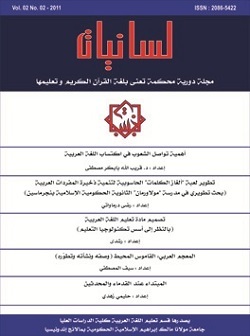 Ijaz Arabi; published twice a year since 2018 (April and October), is a multilingual (Bahasa, Arabic, and English). 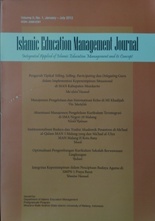 This journal is published by Department of Arabic Language Education, Universitas Islam Negeri Maulana Malik Ibrahim Malang, Indonesia. Editors welcome scholars, researchers and practitioners of Arabic language learning around the world to submit scholarly articles to be published through this journal. All articles will be reviewed by experts before accepted for publication. Each author is solely responsible for the content of published articles. 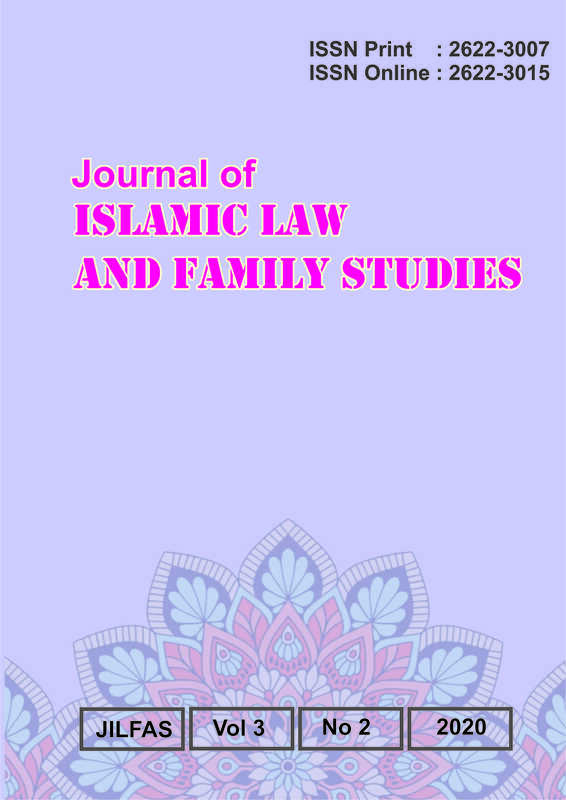 Journal of Islamic Law and Family Studies (JILFAS) is the scholarly journal that publishes original and contemporary researches and thoughts concerning with Islamic Law, Family Studies and other studies relating to marriage, Islamic law of inheritance, gender, interreligious marriage, and human rights as well. JILFaS sincerely invites Muslim Scholars all over the world to disseminate their original research and thoughts in the journal to have Muslim world benefit from them. JILFaS is published by Department of Al-Ahwal Al-Syakhshiyyah (Islamic Family Law) Post Graduate Program of Universitas Islam Negeri Maulana Malik Ibrahim Malang. It is published twice in June and December every year. 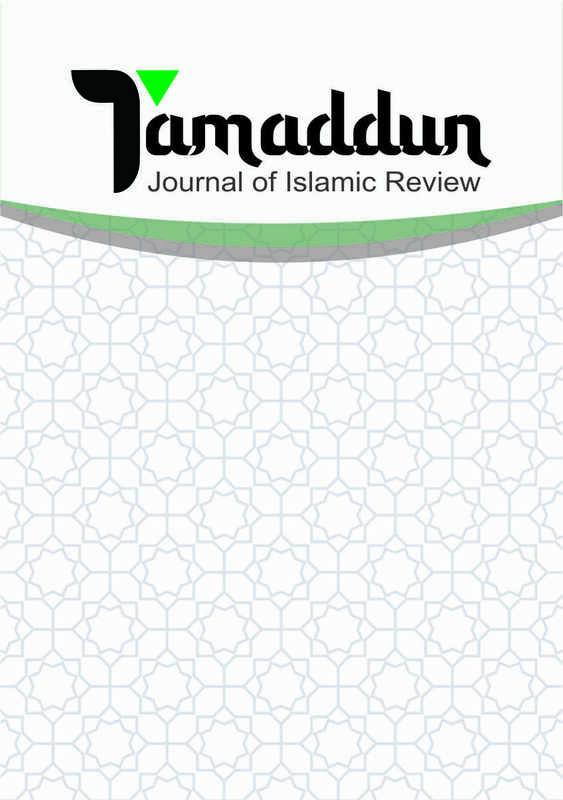 TAMADDUN is scholarly journal publishing fresh and original thoughts and researches pertaining to the studies of Islamic family law (al-ahwal al-shakhshiyyah), Islamic Economy and other areas related to Islamic studies. It is a media for Muslim scholars whose objectives are to share and discuss their opinions, thoughts and researches to each others and to make Islamic values and teachings become parts of the solutions for contemporary problems. TAMADDUN is published twice per year in July and December in collaboration between Department of Islamic Studies, Islamic Economy, and Al Ahwal Al Syakhshiyyah, Postgraduate Program of Maulana Malik Ibrahim State Islamic University, Malang. 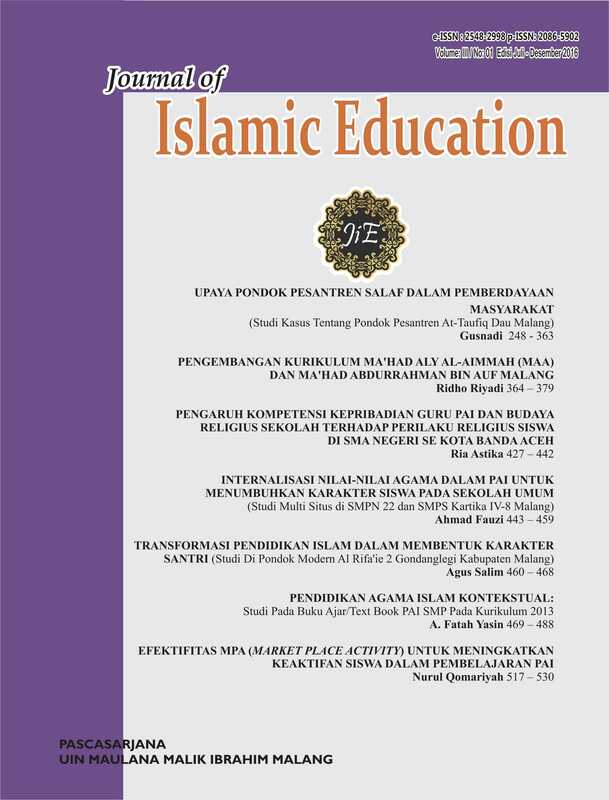 JOURNAL OF ISLAMIC EDUCATION is a Journal of Islamic Education Research published twice a year by Postgraduate UIN Maulana Malik Ibrahim Malang As a medium of socialization, discussion and information about issues around the world of Islamic Education. 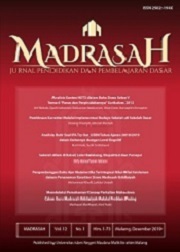 is peer-reviewed journal published by Maulana Malik Ibrahim State Islamic University (UIN) of Malang. 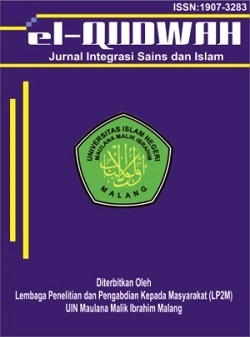 This journal is a pioneer in postgraduate environment of UIN Maulana Malik Ibrahim Malang. We welcome contributions from scholars in the field, papers maybe written in Bahasa Indonesia, English, or Arabic. 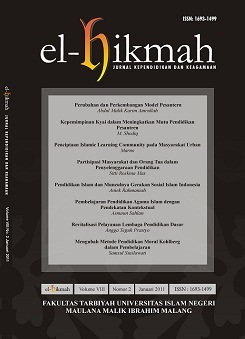 adalah jurnal peer-reviewed yang dipublikasikan oleh UIN Maulana Malik Ibrahim Malang. Jurnal ini menjadi pelopor di lingkungan Pascasarjana UIN Maulana Malik Ibrahim Malang. Redaksi mengundang para akademisi dan pemerhati budaya islam untuk turut berpartisipasi baik dalam bahasa Indonesia, bahasa Inggris, maupun bahasa Arab. 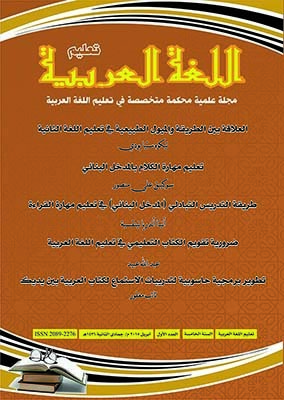 TA'LIM AL LUGHAH AL ARABIYAH adalah jurnal berbahasa Arab yang dikelola oleh Program Khusus Pengembangan Bahasa Arab (PKPBA) di bawah Pusat Pengembangan Bahasa Universitas Islam Negeri Maulana Malik Ibrahim Malang. Terbit dua kali dalam setahun pada bulan Mei dan Oktober. 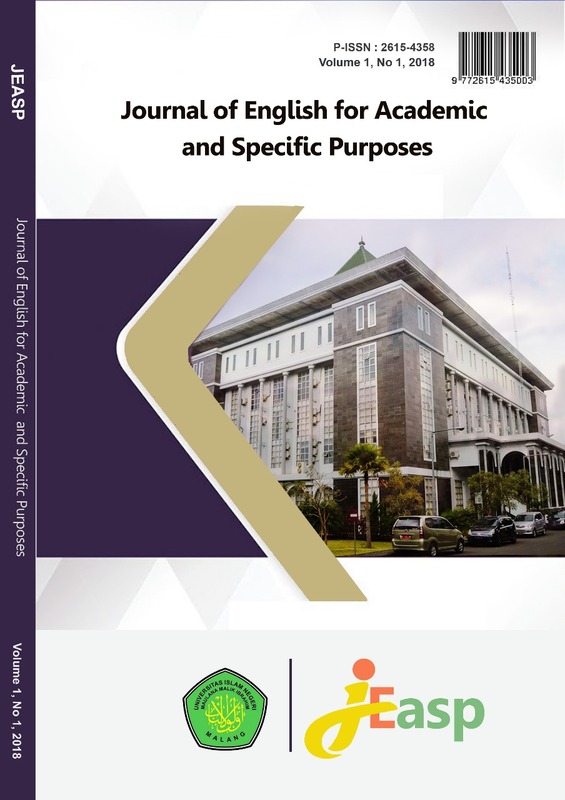 Journal of English for Academic and Specific Purposes (JEASP) is an online scholarly journal published by Language Centre, UIN Malang, Indonesia. The principal aim of JEASP is to publish scholarly research papers, case studies,book reviews, and conference reports based on the most up-to-date research in the fields of EAP, ESP, General, and Applied Linguistics. All papers for publication are selected through peer reviewing with multiple layers of editorial reviews. The editorial processes ensure selected papers to create an academic contribution, relevant, and readable both content and presentation. • Socio-politics in English Language Teaching related to Academics and Language Planning. 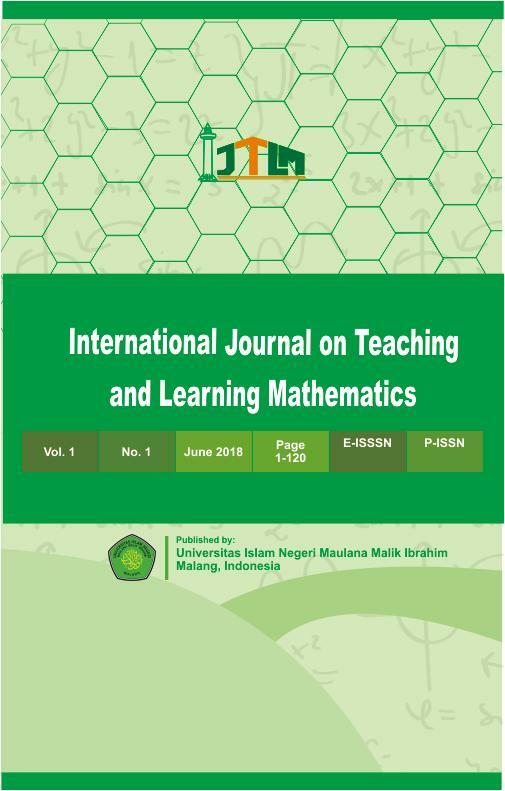 International Journal on Teaching and Learning Mathematics (IJTLM) is an international and peer reviewed open access journal covering research in mathematics education. It includes studies of teaching and learning process, development research, thinking process, problem-solving, understanding, proving, reasoning, ethnomathematics, communication, and educational technology. It is published twice a year in June and December. It contains scientific articles written in English. Psikoislamika: Jurnal Psikologi dan Psikologi Islam ISSN (print): 1829-5703 ISSN (media online) : 2655-5034 adalah media komunikasi dan publikasi ilmiah di bidang ilmu Psikologi yang diterbitkan oleh Fakultas Psikologi Universitas Islam Negeri Maulana Malik Ibrahim. Psikoislamika: Jurnal Psikologi dan Psikologi Islam memuat artikel hasil penelitian dalam bidang ilmu Psikologi dan Psikologi Keislaman, diantaranya bidang Psikologi Klinis, Psikologi Perkembangan, Psikologi Industri dan Organisasi, Psikologi Pendidikan, Psikologi Sosial, Psikometri, Psikologi Eksperimen, Psikologi Terapan. Psikoislamika: Jurnal Psikologi dan Psikologi Islam terbit reguler dua kali dalam satu tahun (bulan Juni dan Desember). Jurnal Psikoislamika terbit perdana pada bulan Juni 2004 dan pada tahun 2018 penerbitan artikel dilakukan menggunakan Open Journal System (OJS). Redaksi Psikoislamika mengundang para pakar atau peneliti untuk ikut menjadi kontributor bagi pengembangan psikologi dan psikologi Islam dari berbagai perspektif kajian (interdisipliner). 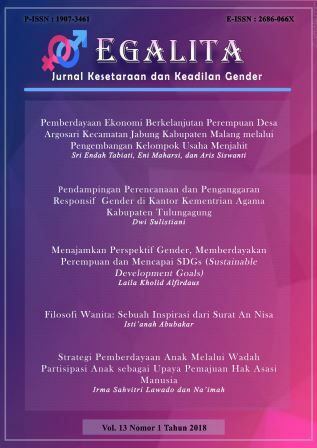 EGALITA merupakan Jurnal Kesetaraan dan Keadilan Gender yang menyajikan sejumlah hasil penelitian, pemahaman dan perenungan mendalam tentang problematika gender, baik dalam bangunan intelektual maupun konstruksi sosial yang ada pada masyarakat. Jurnal saintis merupakan jurnal integrasi Islam dan Sains yang mengkaji multidisiplin ilmu sains yang mencakup kajian riset dan teknologi di bidang Fisika, Kimia, Biologi, Farmasi dan Kedokteran. Secara khusus menaruh perhatian pada pokok-pokok persoalan tentang perkembangan ilmu dan terapannya dalam pembangunan. 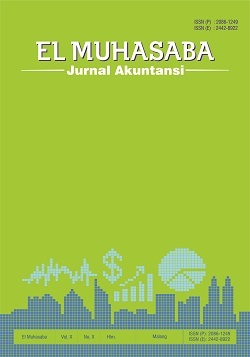 Journal of Research on Community Engagement (JRCE) merupakan jurnal enam bulanan yang memuat naskah di bidang pengabdian masyarakat. Ruang lingkup dari JRCE berupa proses dan hasil penelitian sains terapan, teknologi tepat guna sebagai penunjang pengabdian masyarakat dan kajian analitis-kritis pada pengabdian masyarakat. Silahkan Klik Archives kemudian Klik Table Of Content untuk melihat content jurnal ini. Paradigm: Journal of Language and Literary Studies is one of the professional publications of the Faculty of Humanities, UIN Maulana Malik Ibrahim Malang. The journal presents information and ideas on theories, research, and methods related to linguistics and literature. It includes analyses, studies, application of theories, research report, and reviews in such areas as micro-linguistics, sociolinguistics, psycholinguistics, pragmatics, (critical) discourse analysis, language and culture, applied linguistics, stylistics, literary history, literary criticism, and comparative literature.